Just a quick review, because this is an excellent last-minute gift idea. Scott Hales has created something really cool. The Garden of Enid has a deceptively simple premise: it’s the random musings of a weird Mormon girl. But each of those descriptors — random, weird, Mormon, girl — will be tested and redefined as Hales develops Enid’s character, evolving her from a quirky outlet for the topic du jour, into a living person with hopes, fears, a need to be loved and a human spirit. As Enid gives us a tour of her life, we see the tropes of Mormon teenage life: seminary, dances, school, but Hales also uses Enid to explore topics normally beyond typical teenagers: polygamy, and Church history. 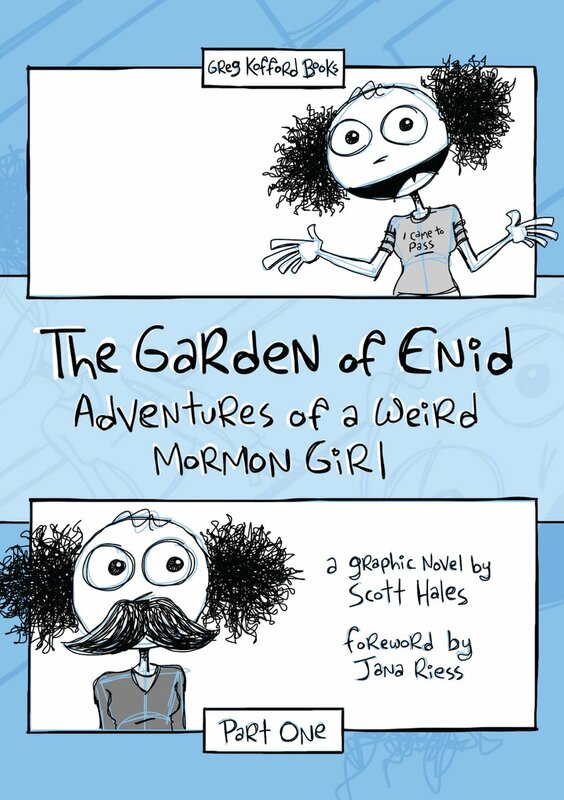 As such, Enid is a bridge between worlds: the comic parody of everyday Mormon life for youth, but the more seriously difficult topics lurking in the background of Mormonism for everyone. It’s a simple comic; the artwork is not amazing and the jokes are often fairly obvious. The cumulative impact, however, is impressive and powerful. It’s hard for me to describe how this character is able to affect us in such a powerful way. Her relationship with her mother, her ward, her friends — these things make Enid real and interesting in ways that show us why comics are meaningful medium. The Garden of Enid originated as a webcomic, so those who followed the series as it originally unfolded will welcome the opportunity to page through the narrative again. Hales has added a little bit of backstory to the panels in an appendix. My kids love the book, too. And Part Two is amazing. Great review. Thanks Steve. Since the name of the town that I grew up in is Enid (Oklahoma), this character has always had a special resonance for me. Yay, this is so good to hear! I have a Garden of Enid comic hanging in my office. I’m pleased that these have been book-ified. Kids have been reading this (in Sacrament meeting, sorry!) and have really enjoyed it. I think that this comic, like a lot of great comics, offers some levels of appreciation for both younger readers and old crows like me. This one of favorite works this year. Enid is fantastic. Go buy it. Now. I’m glad there’s enough to fill a book or two, but I’ve still not gotten over finding out it’s not written by a woman. It was a weird and surprising reaction I’ve still not worked out. Wait – where did you get Part 2? I enjoyed Part 1 but was sad that it ended as soon as it did. I know there’s more; I’ve been following on line! Cate, Part 2 isn’t out – I’m just following along online, like you! Part 2 will be available in February. Thanks for the update on Part 2 – I think it just gets better!